������ Surin is a big province on Mun River Basin in Lower Northeast of Thailand. It is well known, locally and international, for its elephant. The gigantic animal of Surin impresses everyone with loveliness, cleverness and creates unique character of the province. 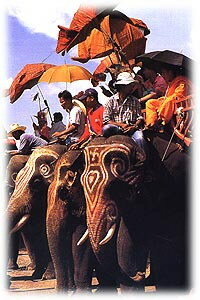 Surin people have long relationship with elephant which becomes icon of the province now. Plenty of Khmer Ruins, beautiful silk and famous jasmine rice make Surin a very interesting destination. Wat Burapharam is on Krung Si Nai Road near the provincial hall. It houses Luang Pho Phra Chi, a sacred Buddha image of the city. This old image was built during the Thon Buri period at the same time Surin was founded. Prasat Muang Thi is 16 kilometres from Surin on the way to Si Khoraphum on Highway No. 226. Three square brick pagodas were part of five on the same base. This monument is dedicated to the first lord of the city. It is located at the southern entrance to the city in the area where the city's inner wall once stood. It was built in 1968. Phanom Sawai Forest Park is 14 kilometres away on the way to Amphoe Prasat and 6 kilometres on a road on the right. The park comprises 3 peaks and a large Buddha image in the meditation posture. The view from the top is quite spectacular. Huai Saneng is a reservoir popular with locals who seek relaxation. It is 5 kilometres from Amphoe Prasat. This Basketry Village is at Tambon Muang Thi on the Surin-Si Khoraphum road at Km. 14-15. When villagers are not harvesting, they make basketry from rattan to sell as household items and souvenirs. Situated at km. 4 of Surin-Prasat Road, on the left before bypass road. The museum features five areas namely geography, archeology, city history, ethnology, and heritages of the province. 1. Geography section features physical of Surin including tomography, climate, geology, soil science, natural resources such as earth, water, forest, wildlife, and national parks. Moreover, it features rice and rice farming, as Surin is of the best place for growing Jasmine Rice. 2. Archeology section features development of people, lifestyle including the second funeral in pre-historical period, antique from Dvaravati, Khmer, and Ayutthaya-Lanchang found in Surin. There are replica of ancient sites presented with motion picture to educate museum goer in the area of archaelogy and art history found in Surin. 3. City History section features history of Surin city from past to present in the presentation boxes. From Kuai ethnic group who caught white elephant escaped from Ayutthaya until Surin City was well established. Other topics include administration reform, significant incidents such as white elephant catching, the first arrival of train to Surin, market at the first stage, education in the past. 4. Ethnology section features four major ethnic groups in Surin namely Suay or Kuai who has excellent skill in catching and training elephant, Khmer who is the native of the region, Laotian who is the latest migratory, and Thai Khorat who came from Nakhon Ratchasima. The presentation replicates lifestyle of different ethnic groups with replica houses, rites, photographs and picture about the traditions. 5. Heritages of the province. Surin is famed for its cultural heritages, which was handicrafts namely silver ornaments, silk cloth, traditional performances, and elephant raising. The later puts Surin on the world map. The presentation of this section includes replica, photographs and motion pictures. The museum is open from Wednesday to Sunday, from 9.00 am. to 4.00 pm.. It is close on Monday, Tuesday, and special holiday. For more information, call 0-4451-3358. Located on Lak Mueang Road, 500 metres west of city hall, the shrine is a sacred icon of the city. At first, the shrine did not house any pillar. In 1968, the Fine Arts Department has designed a new city shrine and got golden cassia log from Mr. Prasith Maneekan, Amphoe Sai Yok, Kanchanaburi, and made it the city pillar. The log is 3 metres long and 1 metre long in circumcircle. The rite and celebration took place on March 15, 1974. Ban Phlai sanctuary is at Tambon Chua Phloeng, 10 kilometres from the district office. This Khmer religious site consists of 3 brick buildings on the same laterite base with a moat surrounding them. The buildings were built around the 16th Buddhist century. This is a Khmer sanctuary beside Highway No. 24, 4 kilometres from the district office. This khmer sanctuary is at Tambon Dom, 10 kilometres from the district office on the Sangkha-Buachet road. This is one of the oldest Khmer sanctuaries in the Northeast and was built around the 12th-13th Buddhist century. Si Khoraphum khmer sanctuary at Tambon Ra-ngaeng at Km. 34-35 on Highway No. 226 is 5 pagodas on the same base. Each is about 30 metres high. Designs adorn the door columns and lintels. The site was built around the 17th Buddhist century. This elephant village at Ban Ta Klang on Highway No. 214 (Chom Phra-Ta Tum) can be reached by going to Km. 36 and left for 22 kilometres. The locals here are called the Suai people. They are skilled in capturing, training and raising elephants. An elephant museum here displays a complete elephant skeleton, its organs, tools used to capture elephants, elephant-raising techniques, and the history and development of Surin elephants. Located at Bn Dan Phatthana, Tambon Dan, this market is a trade centre at the border checkpoint for local Thais and Cambodians. This khmer santuary is 12 kilometres from Ban Ta Miang on Highway No. 214 on the Thai-Cambodian border. Prasat Ta Muan Tot has a square base made of sandstone, similar to those at Ban Phluang. Prasat Ta Muan Thom is 200 metres from Ta Muan Tot sanctuary. Situated near a stream, it consists of 3 pagodas with floral and idol designs. There are also 2 laterite buildings and a pool beyond them. The village, located in Amphoe Khwao Sinarin, is famous for fine silk, weaing with unique patterns and notable silver beads. Located in Tambon Tha Sawang, the village has a weaving plant in ancient style. Silk woven here is produced from very fine thread of silk, dyed naturally, and woven with delicate pattern from the past. The village produces also ancient style cloth called Pha Yok Thong, which is woven from pure silver line and golden-coloured silk. How to get there: The village is 8 kilometres from Surin City. Motorist can across the railway, opposite to Surin Plaza, and keeps going to the intersection. Turn left into Ko Loi - Mueang Ling Road. In addition, Chan Rom village at Km. 9 on the Surin-Sangkha Highway cultivates Indian mulberry for silkworms that are then used to produce ancient-style silk designs and colors. Basketry is also made here. Ban Prasat Sanctuary is at Tambon Phlai, 5 kilometres from the district office on the way to Surin. The only remaining structure is the laterite wall and ancient pool, which is to the east of the site. Built around the 16th-17th Buddhist century. This small sanctuary has very detailed designs. The site is 4 pagodas on a rectangular laterite base. Each pagoda is square and made of sandstone with floral and human figure designs. Ban Phluang sanctuary is at Km. 32 on the Surin-Prasat-Kap Choeng road. เวลาเปิด-ปิด : ปราสาทหินบ้านพลวงเปิดให้ชมทุกวัน ระหว่างเวลา 07.30-18.00 น. เวลาเปิด-ปิด : ปราสาทศีขรภูมิเปิดให้เข้าชมทุกวัน เวลา 08.00-16.30 น.